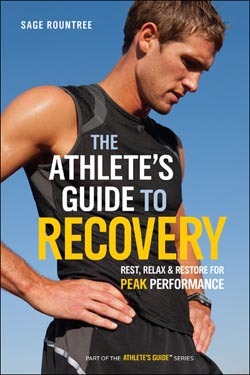 The Athlete's Guide to Recovery is the first and only comprehensive exploration of the art and science of athletic rest. Runners, triathletes, and cyclists will gain more fitness from every workout with this new book from Sage Rountree, an expert cycling, triathlon, and running coach and yoga instructor. The Athlete's Guide to Recovery: Rest, Relax, and Restore for Peak Performance is now available in bookstores; bike, tri, and running shops; and online. Learn more and download a free preview at www.velopress.com/recover. Endurance athletes plan their workouts carefully, yet it's during the crucial recovery period between workouts that they become faster at their sports. Recovery is when the body repairs itself and adapts to become stronger than before. Those who neglect their recovery will gain little from training, risking injury, overtraining, and burnout. Rountree's book guides athletes to full recovery and improved performance. She explains how much rest athletes need, how to measure fatigue, and how to make the best use of recovery tools. Drawing on her own experience and extensive interviews with coaches, trainers, and elite athletes, Rountree details daily recovery practices, demystifying common aids like compression apparel, supplements, and ice baths as well as more exotic technologies. Athletes will discover which methods work and how and when they are most effective. Rountree offers recovery plans for a variety of events, from short distance bike races to ultramarathons, so athletes can rest assured that they are ready for the next phase of training and racing. The Athlete's Guide to Recovery is an invaluable resource that enables athletes to maintain the balance between hard training and rest so that they can feel great and compete at their highest capability. Sage Rountree is an internationally recognized authority on yoga for athletes and an expert endurance sports coach. She is a certified coach with USA Triathlon and the Road Runners Club of America as well as an Experienced Registered Yoga Teacher with the Yoga Alliance. A successful competitor in running and triathlon, she has raced distances ranging from the 400m to the 50K, super sprint triathlon to Ironman®. Sage is a frequent contributor to Runner's World, Triathlete, and Yoga Journal magazines and has contributed to USA Triathlon Life, VeloNews, Running Times, Inside Triathlon, and Endurance magazines as well as several websites. She is a featured instructor at Kripalu and offers yoga workshops for athletes and coaches around the country. Sage is the author of The Athlete's Guide to Yoga and The Athlete's Pocket Guide to Yoga. Learn more at www.sagerountree.com.